Always a sell-out, "Boo at the Zoo," offers families a safe and fun alternative to traditional trick-or-treating. Designed for children ages 3-11 and their parents, this event at the Cleveland Metroparks Zoo, is set up with different candy stations throughout the park. Guests are encouraged to wear fun (not scary) costumes and enjoy refreshments and live entertainment. Visitors to Boo at the Zoo get a chance to see many of the zoo animals up close (but safely). 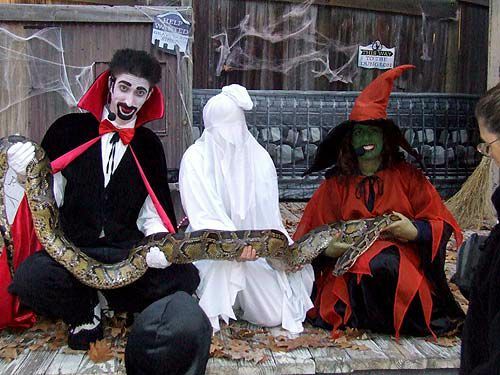 Visitors to Boo at the Zoo are encouraged to wear costumes. In addition to costumed zoo trainers and animal encounters, Boo at the Zoo is all decorated for the season and features food and candy stations, Creepy Crawly Critter Shows, and children's craft opportunities. The 2012 Boo at the Zoo event will be held October 18 through 21 and October 25 through 28, from 6pm to 8pm. Admission is $8. Children 2 and under are free. Tickets are available via the Cleveland Metroparks Zoo Web site or at the park ticket office. Tickets went on sale August 6 for the 2012 event. Kids of all ages will enjoy the non-scary fun at Boo at the Zoo. Clowns are just some of the many "street" performers at Boo at the Zoo.